The Abron Arts Center Artist-in-Residence Workspace Program is now accepting applications for the 2010-2011 residency. The AIR Workspace Program provides free studio space for visual artists for 11 months (beginning September 2010). Applications are due May 1, 2010, 5pm. The Northside Town Hall Community and Cultural Center Inc., (NTHCCC) is looking for artists to present their work in the currently vacant Engine 212 Firehouse – the future home of the NTHCC. All applicants MUST attend a site visit on March 20th from 2pm – 4pm before submitting their proposal. Deadline for Applications is March 31st, 2010. See our Opportunities page for more information about these and other artist calls! The Trinity Project is an art and community exchange program with a home base at Most Holy Trinity Church in East Williamsburg, Brooklyn. Artists of all disciplines can get free or low-cost space for their projects in exchange for volunteer teaching at Saints Joseph and Dominic Catholic Academy or general volunteering with Most Holy Trinity Church. To further our mission of support for local artists, NbPac will be adding and updating our directory of opportunities and resources for artists in North Brooklyn in the coming weeks. Opportunities are deadline-based calls for proposals for specific projects in the Tri-State New York area. Resources are local organizations dedicated to bolstering the artistic and creative communities in New York City, particularly Williamsburg, Bushwick and Greenpoint. If you work with or know of an organization, space or other asset for artists in the community, please email a link and project description to northbrooklynpublicart@gmail.com for inclusion on these pages. March 27th – Help Construct Public Art! Cut, sew, donate and participate – Make public art a community act! Join Brooklyn artist Amanda Browder and North Brooklyn Public Art Coalition (NbPac) in the construction of Future Phenomena, Browder’s temporary public art project sponsored by NbPac and the Brooklyn Arts Council. To help bring this immense, sewn artwork to life, NbPac will be hosting three COMMUNITY SEWING DAYS and we need your help! DONATE – Contribute your unused fabric to help make the piece! We are covering a building and we need a lot of materials! Looking for cotton, sheets, pants, and non-stretchy fabric, and sewing tools such as needles, thread, and scissors. We are also seeking to borrow sewing machines for just one day or donations of machines for the project. For questions or to arrange donations, send an email to anne.palermo@gmail.com with “NbPac” in the subject header. CUT – Help cut fabric to form the chevron shape which will make a true spectacle! SEW – Help sew with easy straight stiches on a sewing machine (tutoring available!) to physically bind the donated fabrics into it’s awesome shape. It will be a fun day of volunteerism and artmaking! Bring your craft-loving family members and friends! 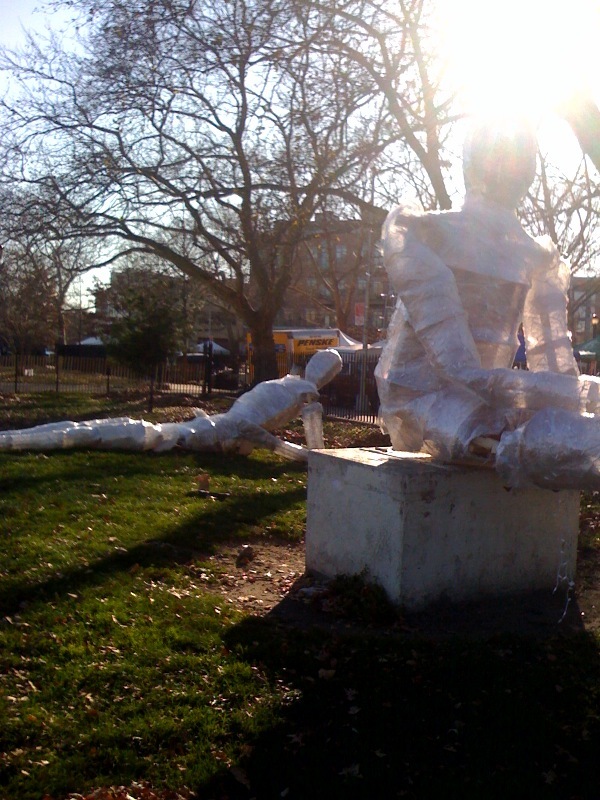 Living Objects Comes Alive in McCarren Park! On December 13th, public art lovers gathered in Williamsburg’s McCarren Park for the lighting of Jason Krugman’s Living Objects, the second installation by NbPac and one of the largest public art installations in the park’s history. Despite the wet weather, the crowd created a festive atmosphere in the park, cheering and clapping when the sculptures were lit and hundreds of LED lights radiated through the figures’ “skin.” Following the ceremony, viewers headed to Light-Up Brooklyn for a reception and to celebrate the grand opening. We invite everyone to check out Living Objects while it resides in McCarren Park (between Union and Driggs) from now until January 23rd. Thank you to everyone who supported this project over the last few months! We could not have done it without our incredible community’s support! Living Object is almost alive! 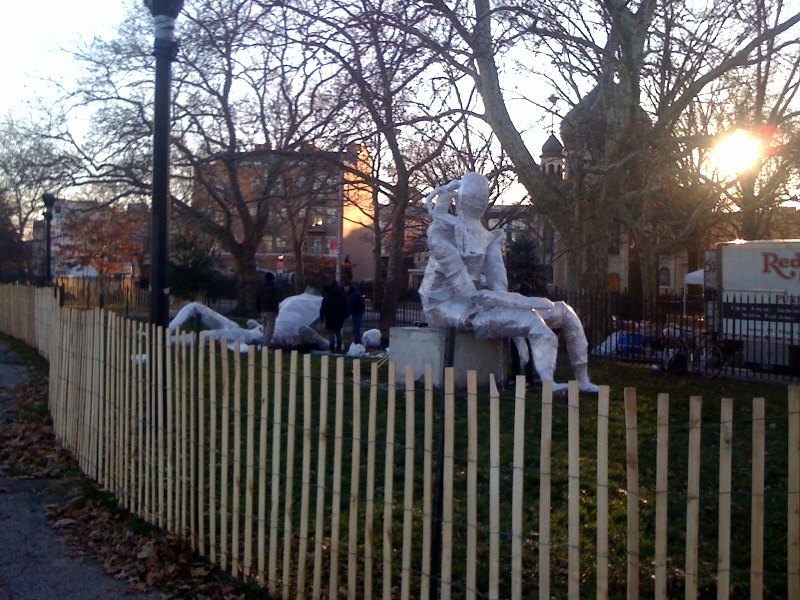 Today artist Jason Krugman began the installation of Living Objects in McCarren Park! Braving the cold weather, but thankful for the sun, the sculptures began to come to life and take shape in their new home, in preparation for tomorrow’s opening. Join us, North Brooklyn Public Art Coalition, in celebrating temporary public art and its power to enliven, invite and enrich our environment and communities. The lighting ceremony will begin at 6pm at the corner of Union and Driggs in McCarren Park. And please join Jason and NbPac after the official lighting at Light Up Brooklyn’s beautiful new showroom located at 174 North 11th for a reception. Meet Jason and hear about his past and future projects, learn more about NbPac and visit Brooklyn’s latest and coolest lighting design showroom as we welcome them to our community! Only three days left to donate via Kickstarter to Living Objects! There are only three days left in our campaign to support Jason Krugman’s Living Objects, the second public art project by the North Brooklyn Public Art Coalition. One of the largest public art installations in McCarren Park’s 100 year history will open this Sunday, December 13th, and we need your support! Help us by donating to Kickstarter so we can reach our goal and enrich the local communities of North Brooklyn through public art. Local artist Jason Krugman has been working hard over the last two months to realize his provocative and beautiful vision of life-size figural sculptures that will provide a beacon of light in Williamsburg. Donate now and be among the many supporters helping us produce innovate installations, create unique opportunities and provide North Brooklyn with great public art! Join us this Sunday at 6pm at the corner of Union and Driggs in McCarren Park to be part of the official lighting ceremony and come to the reception afterward hosted by our lead sponsor, Light Up Brooklyn, located at North 12th street. Join us on the final day of summer for the final show of Moviehouse on India Street. We’ll be showing Brooklyn Docs on Monday, September 21 at 8:30 pm. Two Brooklyn-based documentary teams take you inside our neighborhood, first with a look at pigeon farmers and second with a look at disappearing industry. It’s a fascinating look at where the neighborhood is now and where it might be in the next few years. Filmmakers JL Aronson and Daniel Ross will be on hand to share their thoughts afterward. Up on the Roof follows several devoted pigeon keepers on Williamsburg’s south side through the rigors and rewards of a quintessential New York tradition. The film considers what we lose in the process of renewal and treats the audience like an insider in an unseen and —in many ways— vanishing world. New York City was once the capital of American manufacturing. In 1950, the city boasted nearly one million manufacturing jobs. By 2007 that number had dwindled to 100,000. Today, New York’s surviving factories face stiff competition from foreign imports, and they have to fight for space against condo developments and businesses ranging from art galleries to clothing stores. What has losing this vital source of jobs meant for New York’s economy? It’s all projected on the mural at the end of India Street (between West Street and the East River in Greenpoint, Brooklyn). The India Street Mural Project is the kickoff project for North Brooklyn Public Art Coalition (NbPac) and presented with Council Member David Yassky. It is part of a greater urban revitalization for India Street, the waterfront, and the surrounding neighborhood. The event is part of a four night screening series called Moviehouse on India Street featuring projections by filmmakers, animators, and documentarians from Brooklyn and beyond. The project is funded by Broadway Stages and presented in partnership with Open Space Alliance. Send an email to kdenny@nbart.org to be added to our mailing list! nbpac is a sponsored project of Fractured Atlas, a non-profit arts service organization. Contributions on behalf of nbpac may be made payable to Fractured Atlas and are tax-deductible to the extent permitted by law. first-ever Nuit Blanche festival taking place in New York City October 2nd! Save the Date: October 5th Fundraiser!